What a GREAT first week of school! Y'all, my kids are so sweet! I love them already! Here is a glimpse into what happens in our room the first few days of school. 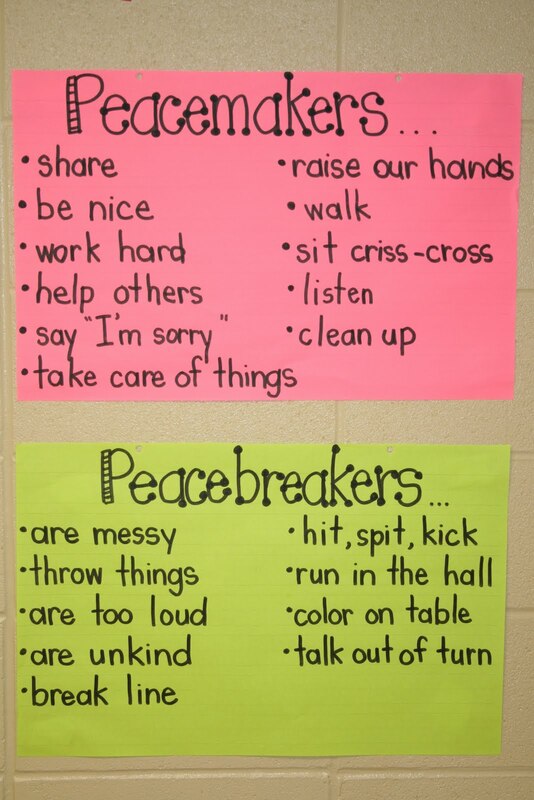 We spent a lot of time learning rules and what it means to be a peacemaker. We read David Goes to School, No, David, and David Gets in Trouble to introduce rules and peacemaking. If you have never read The Peaceful Classroom by Naomi Drew, you should. 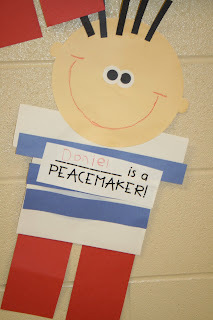 We made an anchor chart about Peacemakers and Peacebreakers....We decided that we all are peacemakers! No one wanted to be "the peacebreaker". I thought it would be fun to make David from our stories so we did! Check him out below. We also read Brown Bear Brown Bear What Do You See? just as an introduction to painting and colors before we hit it hard for the next two weeks. You can check out my Brown Bear Unit at my Teacherspayteachers store here. Here we are learning how to paint correctly. Here is our mural finished! We made character cards and practiced retelling the story with a friend. It looks like an amazing start to the year!! You are an amazing teacher!! Happy Opening al the boxes!! LOVE IT! Enjoy! You deserve all of those boxes from Donors!! I am so glad to help out. Looks like you had a great first week. We start Wednesday, but screen for 3 days. So, I officially start with kids a week from Monday!! Can't wait. Congrats on your Donors Choose items coming in! I can't wait to get my new carpet!! So quick question I love the chester to practice gluing! Is that a document you can share? 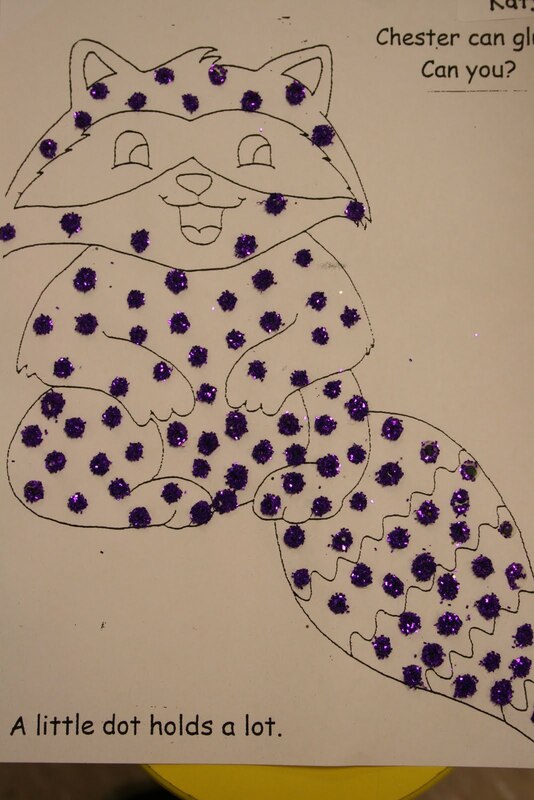 Also I'm guessing you did glitter on the glue dots. I'm always looking for a good way to do glitter any recommendations? I'm with Lindsey - wondering where the Chester glue page came from, and sending congrats for your success on Donors Choose. You've been so generous in the past, it's only right that you are on the receiving end. Thanks! Hi Julie! Thanks for all of the great ideas. This is going to sound like a silly question, but what is the correct way to paint? Do you mind sharing the words you say to the children? This is such a great idea. I'm always hesitant to use No David, but this year I see the light! Thanks for sharing your ideas! I hope to get my blog as nice as yours some day soon! Hi Julie! I found your post by way of Cara at The First Grade Parade. amazon has a few books by Naomi related to creating a eaceful classroom. One is an activity guide. Which book do you recommend? LOVE it! Just joined your blog. Totally adorbs!!!! I love it! Filing this away for next year! 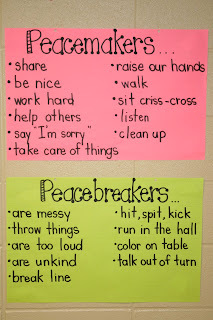 I found your idea about Peacebreakers and Peacereakers from Mrs. Carroll at The First Grade Parade. I ADORE this idea and I can't wait to find the book The Peaceful Classroom. I used this activity in conjunction with Responsive Classroom to develop our class contract. I have to say that our conversations (in 2nd grade) were so much fuller and robust after that introduction. I loved that my students could laugh and have fun while we read the David books. Thank you, Thank you! I plan on giving you props in my blog! I found your blog through Cara at The First Grade Parade. I love all the peacemaker/peacebreaker ideas. How did you make the little David’s? Is there a pattern available? Lots of tattling and conflicts going on in kindergarten. I stumbled across your peacemaker/peacebreaker activity. I'm going to try it in my class. Thank you for all of your amazing ideas. Love the idea about peacemakers! 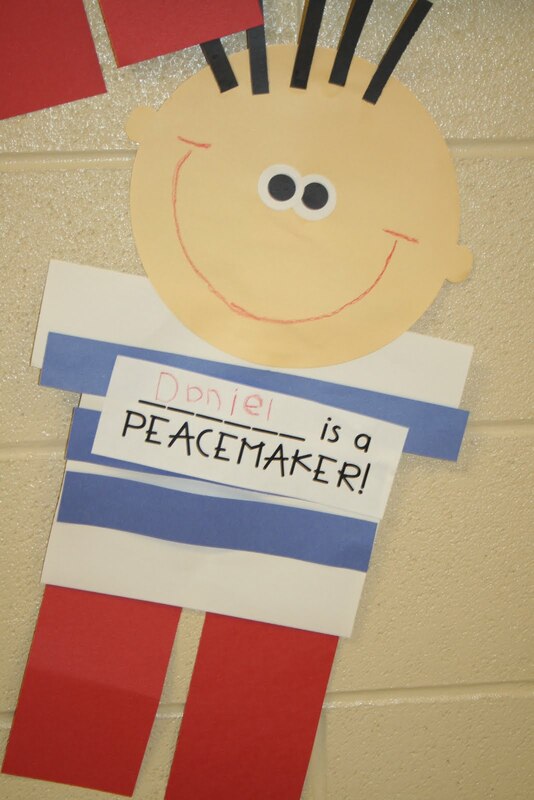 How did you make the "David" characters on the peace makers and breakers poster? Check out her TPT store :) You will find the unit to buy with the patterns! Hi, I am your newest follower! I found you through The First Grade Parade. I LOVE the peacemaker idea. It's totally something that my class this year needs. I plan to do it soon! Thanks for the idea!